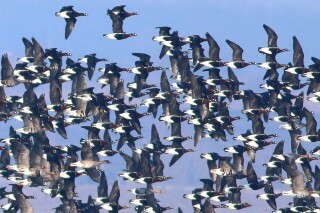 The Red-breasted Geese maintain steady numbers in their traditional wintering grounds in NE Bulgaria. During the goose monitoring on January 23, 2016, carried out by a team of the Wildlife Conservation Society and Neophron Tours, we established 24 430 Red-breasted Geese, of which 12 760 had roosted in Durankulak Lake and 11 760 – in Shabla lake. This is the highest number of Red-breasts recorded in the last three winter seasons in the area of the two lakes. Some 56 990 White-fronted Geese were also counted during the census. 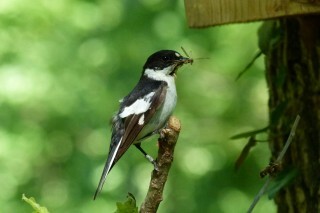 These high numbers followed a cold spell in northeastern Bulgaria prior to the count. Most of the geese were grazing in the winter crop fields not far from the two lakes providing very good conditions for field observations. The two lakes currently host large numbers of other water birds, including Whooper Swans, Tundra Swans, Common Pochards, Red-crested Pochards, Tufted Ducks, Goldeneyes, Smew, Black-necked Grebes, Pallas’s Gulls, Caspian Gulls, Common Gulls, Great Bittern, etc. 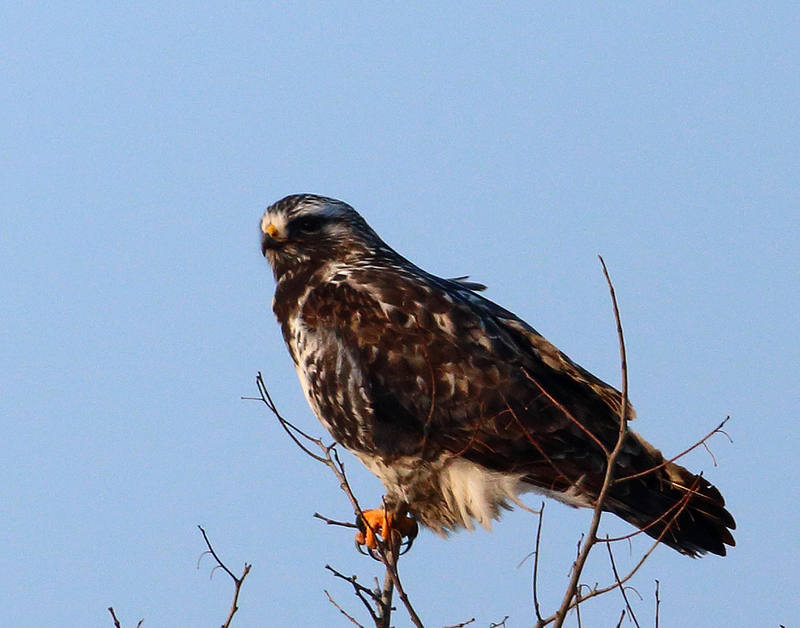 The numbers of raptors in the area of the two lakes has also increased, following the cold spell. During the count we recorded about 30 Rough-legged Buzzards, 2 Long-legged Buzzards and more than 100 Common Buzzards, plus 5 White-tailed Eagles, 55 Marsh harriers, 18 Hen Harriers and 3 Merlins. Nestboxes – 218 boxes were used during the season (during the winter 12 had disappeared but they were replaced with new ones before the breeding started – Another two (empty) boxes disappeared during the season). After the unusually warm weather at the end of 2015, the cold spells finally reached Bulgaria with the New Year. 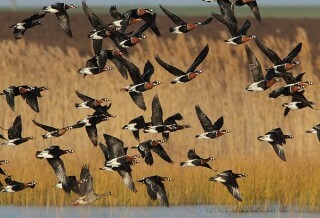 A large number of waterfowl and other birds arrived from the north to find refuge in the northern Bulgarian Black Sea lakes Durankulak and Shabla. 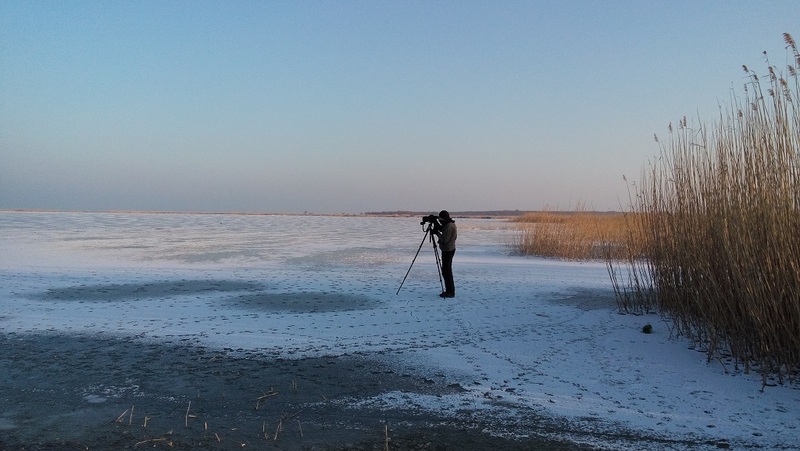 During the bird census carried out by a team of the Wildlife Conservation Society on January 2, 2016, we established 6980 Red-breasted Geese (of which 5830 in Durankulak and 1150 in Shabla lake) and 2025 White-fronted geese ( 1205 in the Shabla lakes and 820 in Durankulak). We also observed 11 Greylag geese, traditionally wintering in small numbers in the two lakes. All of the observed geese had roosted on the lakes.